Marshall defenders Brandon Drayton (8), Ryan Bee (91) and Frankie Hernandez (35) combine to take down Kent State quarterback George Bollas (2) during the first half of Saturday night’s non-conference football contest at Joan C. Edwards Stadium in Huntington, W.Va.
HUNTINGTON, W.Va. — There were a handful of flashes, but they were more green than golden. 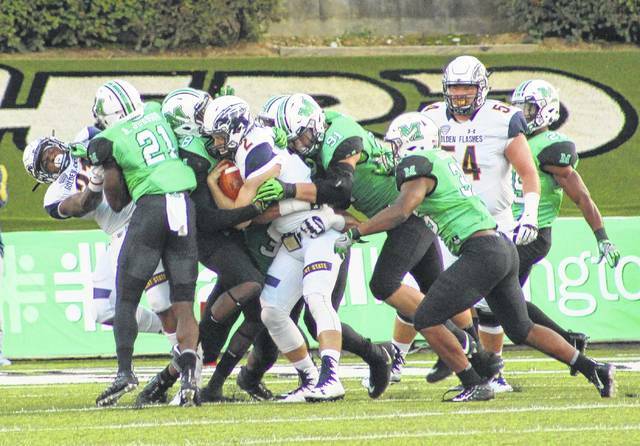 Marshall recorded its first shutout in just under two years while mustering enough offense to secure a 21-0 victory over visiting Kent State on Saturday night in a non-conference football contest at Joan C. Edwards Stadium. MU, conversely, produced a season-high 158 rushing yards en route to 381 total yards of offense — which included the hosts’ first two rushing touchdowns of the year late in the fourth quarter. Clinging to a narrow 7-0 lead through three periods, the Herd strung together a 9-play, 62-yard drive that was capped by a Chase Litton 14-yard touchdown run. Litton’s diving lunge at the goal line gave Marshall some breathing room with a 14-0 edge with 7:03 left in regulation. The Flashes’ ensuing drive stalled with 4:47 remaining at the MU 40 due to a loss of downs, then the hosts responded with the proverbial nail in the coffin. The Herd covered 60 yards in seven plays, with Tyler King delivering the knockout blow with a 29-yard TD run — giving the hosts a 21-point lead with 1:08 remaining. King also carried the ball on all seven plays of Marshall’s final possession. The Green and White held KSU without a single passing yard in the first half, then churned out 121 rushing yards after the break while clinging to a slim 7-0 lead. King produced all but one of his 101 rushing yards in the fourth quarter, becoming the first MU running back to reach the century mark since current teammate Anthony Anderson put up 109 yards on 16 carries during a 42-17 win last year against Middle Tennessee. The Herd posted a 62-0 victory over Morgan State — a Football Championship Subdivision program — in the 2016 season opener, but Saturday night marked Marshall’s first shutout of a Football Bowl Division school since thrashing Florida International by a 52-0 margin back on Nov. 14, 2015. MU coach Doc Holliday was pleased with the way his troops gutted out an important victory. He also noted that it makes going into a bye week a little easier while preparing for their next contest at historic Nippert Stadium against the Cincinnati Bearcats on Sept. 30. “Sometimes you have to grind a game out and find a way to win it,” Holliday said. “They are a well-coached team and they are a tough team. I was proud of the way the defense prepared and played this week. Anytime you shut somebody out, you’re happy with that. After a scoreless first, Kent State lost starting quarterback Nick Holley to an injury early in the second quarter — putting pressure on backup George Bollas to keep the Blue and Gold’s triple-option offense moving. That, however, didn’t happen as the Golden Flashes were just 1-of-8 on third down plays in the first half. The guests punted three times, missed a field goal and also turned the ball over on downs all before halftime. Marshall received its final punt before half with 2:15 remaining, then marched 71 yards in 13 plays to break the scoreless tie after Litton found Marcel Williams on a 5-yard TD pass with just six seconds remaining. Both teams committed a turnover and each program was flagged for eight penalties. The Herd claimed a 23-14 advantage in first downs and had 75 yards in penalties, while the guests surrendered 80 yards in penalties. The Herd produced 158 rushing yards on 33 attempts, an average of 4.8 yards per carry. Keion Davis followed King with 26 yards on nine carries, while Litton added 25 yards on three scrambles. Litton was 23-of-43 passing for 223 yards, throwing one touchdown and one interception. Williams led the MU wideouts with 79 yards on eight catches, while Tyre Brady hauled in five grabs for 71 yards. Ryan Yurachek also had four catches for 24 yards. The Herd recorded seven sacks in the triumph, with Damien Dozier leading the way with three sacks and Ryan Bee had two sacks. Nazeeh Johnson and Davon Durant also recorded a sack apiece for the hosts. Chase Hancock led the Herd defense with 11 tackles, while Bee had 10 stops — including two for loss. Chris Jackson picked off a KSU pass on the opening drive of the second half. Justin Rankin led the Golden Flashes with 44 rushing yards on six carries, followed by Holley with 35 yards on four first half carries. Bollas was 4-of-12 passing for 55 yards and threw a pick. Dustin Crum was also 3-of-5 in the air for 62 yards. Kent State had five receivers catch a pass, but only Mike Carrigan hauled in more than one after producing 35 yards on three grabs. Jamal Parker led KSU with 12 tackles, while Jim Jones and Mandela Lawrence-Burke both added 11 stops apiece. The guests did not record a sack and Demetrius Monday had a late first quarter interception. Marshall now owns a 19-18 lead in the all-time series with the Golden Flashes, including a dozen consecutive wins in the series since 1980. MU also improved to 2-0 at home this fall while going unbeaten against Mid-American Conference opponents. Marshall honored 2017 Athletic Hall of Fame inductees Ahmad Bradshaw, Bob Gray, Eric Ihnat, Bill James, Katie Stein Mason, Amanda Williams Paz, Keith Veney, David Wade and Rusty Wamsley before the game.